Würzburg is idyllically situated in the midst of one of the biggest wine-growing regions in Germany. Tradition comes to life at the many wine festivals in the city and surrounding area. This is a city bursting with baroque splendour and countless historical buildings. The university is the oldest is the federal state of Bavaria. History is almost tangible in Würzburg: throughout the city you`ll see signs of bygone days. This attracts tourists from all over the world to northern Bavaria, but the locals, too, speak enthusiastically about "their" Würzburg. Würzburg`s Residence ranks among the most important palaces in Europe. It was designed by famous architect Balthasar Neumann. Perched high on the hill is the Marienberg fortress. From here you can enjoy a magnificent view of the town. Today, the fortress houses two museums: the Mainfränkische Museum Würzburg and the Fürstenbaumuseum. The Mainfränkische Museum displays objects of art and artefacts from the Würzburg region. In the Fürstenbaumuseum, you can admire precious furniture from the fortress and a collection dedicated to the history of the city. For centuries, the church has played a central role in Würzburg. The city`s churches were built in different eras, such as the Gothic, Renaissance and Baroque eras. One typical example of baroque architecture is the "Käppele", a pilgrimage church on Nikolausberg above the town. You`ll discover lots of typical baroque elements throughout the city. Right next to the town hall in the old part of town is the cathedral of St. Kilian. The river Main flows through the middle of the city. And its bridges, the "Mainbrücken", are a key feature of the cityscape. 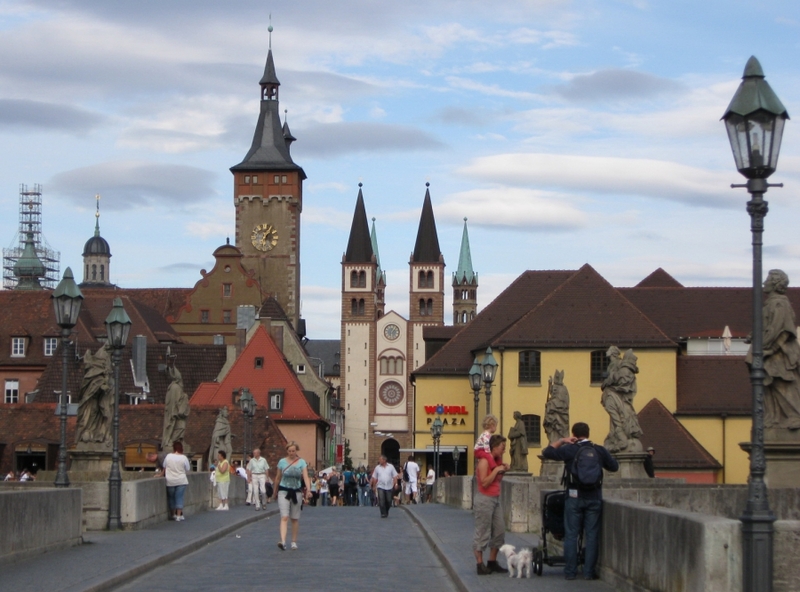 The oldest and perhaps most famous bridge is the "Alte Mainbrücke" which links the Altstadt with the Marienberg fortress. The bridge is a popular meeting place for students: they like to come here to enjoy a glass of real Franconian wine together. The wine comes straight from the vineyards just outside the city and is central to life and work in Würzburg. It plays a key role in the region`s economy and throughout the year the people of Würzburg organise wine festivals. The people of Würzburg love to spend their evenings at wine festivals. They enjoy regional culinary specialities washed down with local Franconian white wine. In the summer you can go to the wine festival on Marktplatz or visit "Wein am Stein". This winery has a very special atmosphere since you sit in the winery courtyard right in the middle of the vineyards (wine festival dates are advertised on the City of Würzburg website). Although the people of Würzburg tend to drink wine rather than beer, the city also has typical Bavarian beer gardens. And these are particularly popular among students. Right next to the Main is the "Alte Kranen" which has lots of outdoor tables. The restaurant is named after its location next to the "Alte Kranen", a baroque harbour crane on the river Main. Thanks to the Julius Maximilian University, Bavaria`s oldest university, the city is teeming with students! There is an active and varied nightlife here. Well-known and popular among students are "Café zum schönen René" in a pavillion next to the main station, and "Zweiviertel" on Hörleingasse in the city centre. The Residence`s courtyard garden is the perfect place for taking a well-earned break. You definitely have to go to one of the wine festivals in Würzburg! They define the atmosphere and way of life in the city. You should also do wine-tasting in one of the many wine cellars. It`s a good way of finding out about wine, and you often get some good food too. A perfect mixture of music, food and dance is offered by the Afrika-Festival which takes placeevery year at the beginning of the summer. Groups and artists from all over Africa present their culture. For just a few euros, you can find out more about the African continent. "Umsonst and Draussen" (free and outside) is the name of a festival that takes place on the Talavera-Mainwiesen. Many local bands perform here. Alongside music, there are exhibitions, activities to join in and sporting events (for more information read the festival website). Traditional wine festivals, unusual music festivals or modern restaurants – people from all over the world play a key role in Würzburg. While the true "Würzburger" like to pass on their traditions, incomers (people who have moved to Bavaria from elsewhere) guarantee the city`s international flair.